Grooming is not only about what you wear, it’s about keeping yourself stylish and very importantly choosing the right product for yourself. Grooming is about developing a daily routine that is quick, simple yet effective and impressive. 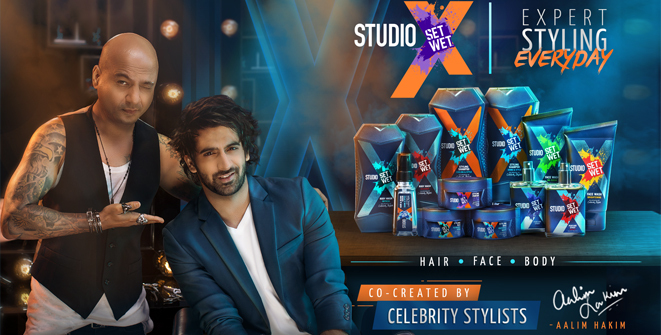 Studio X is a range of male styling, grooming premium products co-created by celebrity stylist Aalim Hakim that helps create celebrity stylized looks every day at home. Studio X Perfume Spray (Impact) - contains notes of sandalwood and citrus that helps you make the right impact. Studio X Body Wash (Refresh) - unleashes a rush of cool aqua fragrance. Consists of menthol which gives a mad burst of cooling to your body. Studio X Face Wash (Oil Clear) - Energizing massage beads that clean pores fromwithin; helps get rid of dullness. Studio X Face Wash (Brightening) - contains Claire Blanche II which is a natural skin brightening ingredient. It effectively cleanses grime and pollution-moisturizing your skin. Studio X Styling shampoo- Cooling and style, gives your hair a perfect balance of softness, smoothness and volume neededfor everyday superior styling. Provides an instant burst of aqua cooling. Studio X Hair Wax- Freestyle Matte AND Clean Cut Shine - Gives your hair a natural shine and makes your hair easy to restyle. Helps you get a medium hold and you can create a range of styles. Studio X Pomade (Shine & Texture)- Helps style a slick and wet look; easy to use anytime anywhere. Gives a perfect party-ready finish. Studio X hair and beard serum for men- Conditions hair and beard for a frizz-free and neat look. Gives smooth and manageable, easy to style hair.